Homemade Biscuits are so incredibly easy no one should ever have to buy 'canned' biscuits from the store! 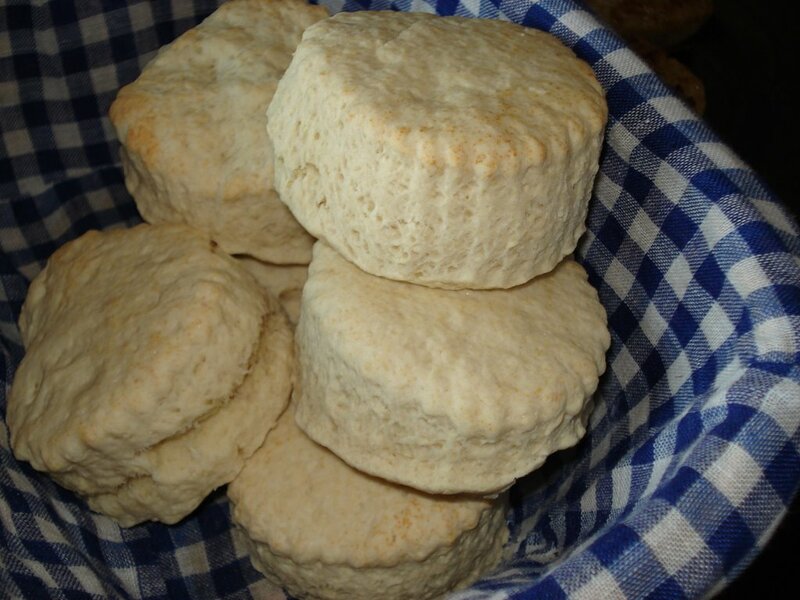 I remember my first attempts to make biscuits as an 18 year old new bride. They weren't pretty. I had only 1 real 'cookbook' at the time, given to us as a wedding gift by a friend. Using the cookbook, I kneaded the dough like it said to... and ended up with hockey pucks. Rock hard inedible pucks. I only tried to make biscuits a couple more times over the years and they were disheartening. They were edible for the first 5 minutes out of the oven but as they cooled, they hardened. In 1996 I stumbled on this recipe for biscuits and noticed this one said NOT to knead the dough. 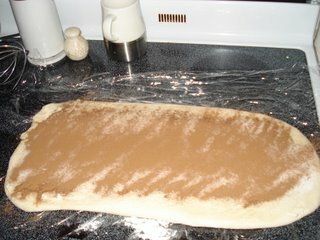 You 'pat' it into a rectangle but after mixing, there was no kneading. And? I've been making them ever since. Place the flour, baking powder and salt into a large bowl and stir or whisk together. Add the butter in pieces (I grate mine with a cheese grater) and 'cut in' until crumbly using your fingers. Stir in the sugar and add the milk all at once. Mix with a fork until it holds together. Remove the dough and pat into a 1 inch high rectangle or circle with your hands on a lightly floured surface. Using a biscuit cutter or a circle cookie cutter cut straight down, do not twist! 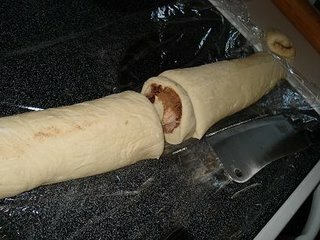 You can use a knife and slice the dough into squares if you don't have a cutter. Place on an ungreased pan. Brush with melted butter if you prefer and bake 12-15 minutes at 450. 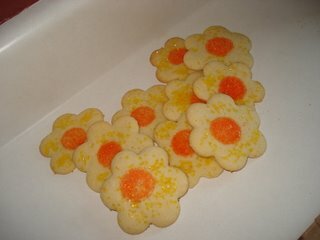 Needing to have a 'quick snack' for the kids and their friends one day I whipped up some quick and simple flower cookies. Use your favorite sugar cookie recipe and roll out. Using a flower shaped cookie cutter I cut out the flowers. The trick of course is in the decorating. To make the perfect centers I used an apple corer! A 2 pc. apple corer is the metal circle with a wooden handle and a wood dowel to push through. I gently placed the metal circle on the cookie dough and dropped a bit of orange sugar into the cylinder. Wha-la! Instant quick and simple centers! Pinching a bit of yellow, pink and red sugar around the centers the cookies were ready to bake (and eat) within minutes. 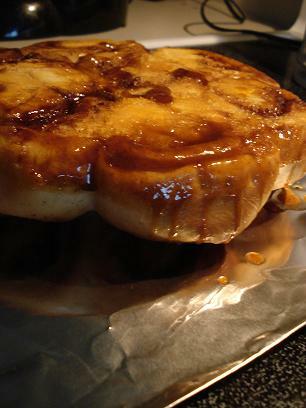 Place into a round pan that has been greased. Bake 375 for 25 minutes until golden. on greased foil or a serving plate. A beautiful way to serve stuffed fish. Delicious too, it's been a staple in our home since 1994. Preheat oven to 375. Sprinkle each fillet with salt and pepper. Coil each fillet into a buttered muffin tin. Sauce the onions, parsley and celery in 3 T butter. When tender, remove from heat. Add the crumbs, flaked crabmeat and the egg. Mix and season to taste. Spoon into the center of each fish fillet. Brush with the remaining 3 tablespoons of butter. Bake 20-30 minutes or until your fish is done. Meanwhile make the sauce by microwaving the butter until melted; add the flour and seasonings, then the milk and lemon juice. Microwave 4-5 minutes, stirring after each minute. Carefully remove each coil of fish and top with a drizzle of sauce. Serve immediately with more sauce to pass. Mix together and chill at least 2 hours to blend flavors. Taste after 2 hours and season accordingly with more salt, pepper or sugar. This is almost embarrassingly simple! Mix together the salmon, eggs and enough crushed crackers to hold shape. Salt and pepper to taste. Shape into a large walnut sized ball and smash into a patty. Place on plastic wrap or foil and refrigerate for at least 30 minutes till firm. Fry each patty in a thin layer of oil over medium high heat until golden brown on each side. Drain on paper towel or napkin covered plate and serve hot with your choice of a sauce or tartar sauce. I may be compensated to provide opinion on products, services, websites and various other topics. Even though I sometime may receive compensation for posts or advertisements, I always give an honest opinions, findings, beliefs, or experiences on those topics or products. The name "American Housewife" stems from an idea for a cookbook I'd love to put out. 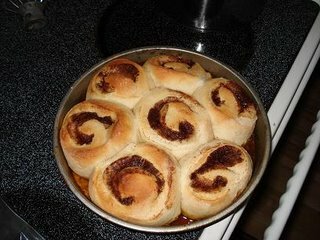 Somehow I never felt the time was right or I didn't have the funds to make it happen... but then the internet came along and the chance to have a recipe website presented itself to me. The name American Housewife was a natural. As for the url of the site; housewifebarbie - well, that stems from a joke. Back in the late 90's I was a full time Mommy with three children under the age of 5. I loved cooking, baking, sewing, crafts and everything to do with babies and children. My friends dubbed me the Original Housewife Barbie... after the Barbie doll that has done everything from being an astronaut to a doctor to a teacher, but never 'just a housewife'. I was deemed the original Housewife Barbie and when I had to think of an original url for a website it again seemed only natural to use it. I am a busy wife and mother with three teenagers. Cooking and baking come naturally to me and I rarely use recipes... instead I look to them for guidance and ideas and then do my own thing. In our family it's a joke that the only time something doesn't turn out for me is when I actually follow a recipe to the tee. LOL. This site is a collection of recipes I've gained over the past 25 years since I was in Junior High. Some from the 1,000 recipe books and magazines I have, some from the internet, some from friends, family members, my grandmothers old handwritten school notebook from cooking class and various other places. It's a collection of recipes that also includes those that I've made up myself for my own family. Enjoy!